Dr Delia faces loan repayments of €3,933 monthly with HSBC, €1,413 with BNF and €835 with BOV. 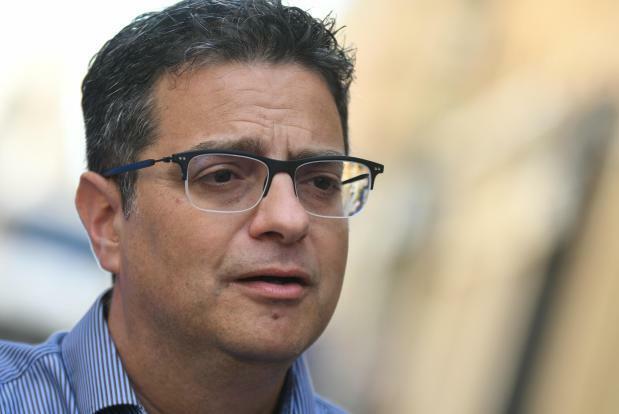 Nationalist Party leader Adrian Delia is facing loan, spousal maintenance payments and other monthly commitments, including the lease of a Jaguar, of over €9,000, documents seen by Times of Malta show. While his salary as Opposition leader leaves him with around €2,700 in hand per month, Dr Delia insisted during a meeting with Times of Malta that he was keeping up with his monthly commitments. Questions about how he funds his monthly expenses intensified in December after a court ordered him to pay his estranged wife €2,750 monthly in spousal maintenance. Documents seen by the newspaper show that Dr Delia faces loan repayments of €3,933 monthly with HSBC, €1,413 with BNF and €835 with BOV. He also makes use of credit card and overdraft facilities with all three banks. Dr Delia told Times of Malta that it was no secret he had loans with HSBC, BNF and BOV, as this was declared in his financial submissions to Parliament. This declaration shows the loan amounts total for 2017 amounted to €700,000. The Opposition leader declined to comment on the amount of the monthly loan payments without having sight of the documents Times of Malta was referring to. Dr Delia said he had sold his shares in his law firm and the amount of the sale was being repaid to him in monthly instalments. “The funding of what you are asking about is coming, at this stage, from the repayment of the shares that I sold,” he said when asked how he was keeping up with these monthly expenses. He declined to state the precise amount of the monthly payments for his shares, insisting it was an agreement involving private individuals. “I abided by my legal obligations by declaring my shares and my liabilities and I also can confirm that the amount I am receiving is enough to cover my loan repayments,” Dr Delia said. The Opposition leader said the eventual sale of his shares in Mġarr Developments Ltd would also be a future source of income, though he acknowledged that the timing did not depend on him as units were still being sold and loans for the property development paid off. Slain journalist Daphne Caruana Galizia had published documentation in 2017 showing that Dr Delia together with his wife are jointly and severally responsible together with other shareholders in the property company to pay a €7 million debt with HSBC. Apart from the loan repayments, Dr Delia committed himself in March 2017 to pay €629 monthly to lease a Jaguar which he admits he barely uses now since Parliament provides the Opposition leader with a car. Questioned why he chose to lease a Jaguar given his debts, Dr Delia rebutted that the car was leased before he entered politics, and at that point in time he could afford it. “At the moment in time when I cannot afford it anymore, I will have to see how to come to an arrangement. When I got it the issue was whether it was more worthwhile to lease it or buy it,” he said. He also expressed his distress that this “stolen” information was in Times of Malta’s possession. Dr Delia also pays €21,000 in school fees, amounting to €7,300 per term. Banking correspondence seen by Times of Malta shows that BNF bank asked Dr Delia to provide more information about a €308,000 payment made by one company into his account, along with multiple inward payments totalling €106,000 from another company during 2015. The queries about the past payments were made due to Dr Delia’s status as a politically exposed person, who are vetted more vigorously by banks in line with anti-money laundering regulations. Dr Delia also expressed his “serious concern” that information about BNF’s queries was in Times of Malta’s possession. For source protection reasons, Times of Malta declined all requests by Dr Delia to see the documents in question. He said that since he became a PEP, all banks did their standard checks and the requested information was supplied without any issues being raised.